Total Home Supply has just added a whole new line of indoor and outdoor fire products to their website, but these are no ordinary fireplaces. We partnered with EcoSmart Fire because their products allow consumers and businesses to enhance their style while still being eco conscious. Inspired by traditional notions of fireplace designs and concepts, EcoSmart Fire works in collaboration with their own team of designers to offer series of fire boxes, fire pits, lamps, lanterns, and fire towers that are efficient and durable, as well as environmentally friendly. Total Home Supply is proud to be distributing an impressive variety of EcoSmart Fire’s innovative, bioethanol-fueled fireplaces and accessories, suited for indoor or outdoor, residential or commercial use. "We partnered with EcoSmart Fire because their products allow consumers and businesses to enhance their style while still being eco conscious,” says Total Home Supply spokesperson, Mickey Luongo, “That dream backyard or living room you always see on TV can now be yours." With dozens of products offered in various shapes, sizes, and designs, there is surely a unit to suit any need or purpose. Consumers adore the contemporary style and clean shapes of the EcoSmart Fire fireplaces, the convenience of each unit’s freestanding and portable capabilities, and the added luxury of ample heating and lighting, without the smoke, soot, ash, or odor all too common with traditional, wood-burning units. The EcoSmart Fire secret to success lies in their use of e-nrg bioethanol, a clean-burning and eco-friendly biofuel produced naturally by the fermentation of the sugars of plants. Bioethanol is safe to use and safe to store, and produces no by-products of combustion other than heat, steam, and minimal amounts of carbon dioxide. 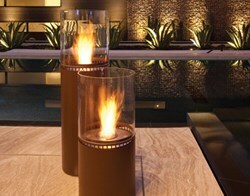 TotalHomeSupply.com offers EcoSmart Fire indoor and outdoor fire products, as well as product accessories (protective covers and fire screens) and fuel. Total Home Supply is a leading online retailer of air conditioners, heaters, appliances, and more selling these products through their website at http://www.totalhomesupply.com. They offer products for both home and businesses and deliver industry leading service.